Decitabine is a DNA methyltransferase inhibitor, incorporating into DNA and resulting in hypomethylation of DNA and intra-S-phase arrest of DNA replication. It is used to treat myelodysplastic syndrome (MDS). (A) and (B) SW1116 and LOVO cells were plated, treated for 48 h with decitabine (DAC) and gefitinib (GEF) either alone or in combination, and the expression levels of AKT, mTOR, S6K, and phosphorylation were determined by Western blot analysis as described under Methods. Expression of β-actin served as a loading control. The data are representative of three independent experiments. Azacitidine is a nucleoside analogue of cytidine that specifically inhibits DNA methylation by trapping DNA methyltransferases. 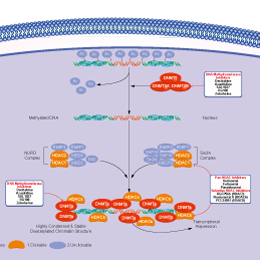 R-2HG treatment or chemotherapeutic treatment, especially their combinations, decrease MYC levels in leukemic cells (using MONOMAC-6 as a representative). AZA:Azacitidine. RG108 is an inhibitor of DNA methyltransferase with IC50 of 115 nM in a cell-free assay, does not cause trapping of covalent enzymes. The inhibition effect of RG108 on M.SssI MTase activity. Zebularine is a DNA methylation inhibitor that forms a covalent complex with DNA methyltransferases, also inhibits cytidinedeaminase with Ki of 2 μM in a cell-free assay. (A) Zebularine treatment suppresses fibre development in vitro. This figure shows that 0 day post anthesis (DPA) ovules cultured for 10 days exhibit different fibre lengths. Different concentrations of zebularine (20, 40 and 80 μM) were applied. Thioguanine, a purine antimetabolite, inhibits DNMT1 activity through ubiquitin-targeted degradation, used in the treatment of acute lymphoblastic leukemia, autoimmune disorders (e.g., Crohn's disease, rheumatoid arthritis) and organ transplant recipients. SGI-1027 is a DNMT inhibitor with IC50 of 6, 8, 7.5 μM for DNMT1, DNMT3A, and DNMT3B in cell-free assays, respectively. Following the incubation of the unmethylated DNA probe with DNMTase in the presence of spotted DNMTIs, Cy5 intensity values were measured before ( I0 ) and after ( I30 ) of endonuclease cleavage. Each data set was normalized to the initial fluorescence signal within the corresponding block and the resulting ratio describes the net CpG sites remained uncleaved (盨.D., n = 64). The red line represents the inhibitory threshold determined as two standard deviations below the averaged 'unspotted' ratio. On-chip visualization of the corresponding remaining Cy5 signal is placed on the bottom of each column.